Bringing Pedal Powered activities to your event increases the fun and participation and puts people in an open, joyous, and receptive state, where they’re ready to interact and learn. It’s green energy in action! Our activities provide a way for people to use their own muscle power and instantly achieve a delightful and memorable result. Our most popular activity — and the most accessible starting point for anyone interested in Pedal Power — is Bike Blending. We’ve spent the last 13 years developing Pedal Powered activities that help everyday people experience their power to make change. From 1-bike stations like Bike Blenders and Recharge Stations to 20-bike concert systems , Pedal Power rocks! We do the hard work of engineering the bikes and systems to be safe, dependable, educational, and fun. You bring in your group and share the gift of human power with people for the first time. Please click More to read on about all our Pedal Powered activities, or, for info about the ones we rent and our rental program, check out our handy table of rentable Pedal Powered Activities! Students will watch the mechanisms of this unique contraption in amazement, and will want to get on and make a smoothie for their peers. It’s a great teaching tool: you can lead lessons about physics, energy conservation, nutrition, health, and fitness. We offer three models of bike blenders to fit your needs: Fender Blender Pro, Fender Blender Universale, and Fender Blender Xtracycle. For a wider variety of gourmet activities, get a High Performance upgrade on any of these. 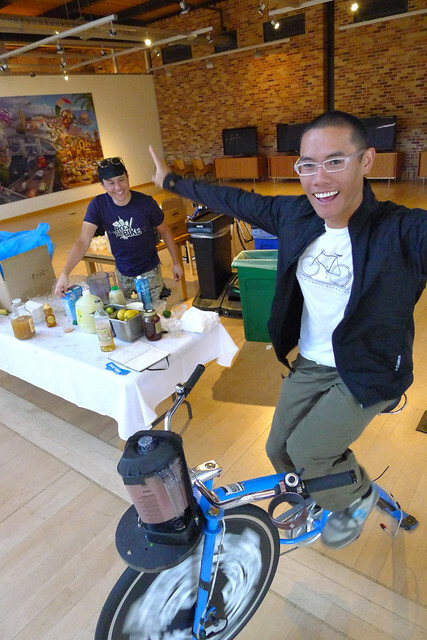 A proper smoothie booth will need a table and at least a 5 x 10′ space for the bike and crowd. Ingredients will cost between $0.25-1.00 per serving, depending on serving size and whether you go organic. If your goal is pure fundraising, we hear that flavored ices are the cheapest way to satisfy a sweet tooth. Since it doesn’t require electrical power you can easily make a smoothie stand anywhere–indoors or out. 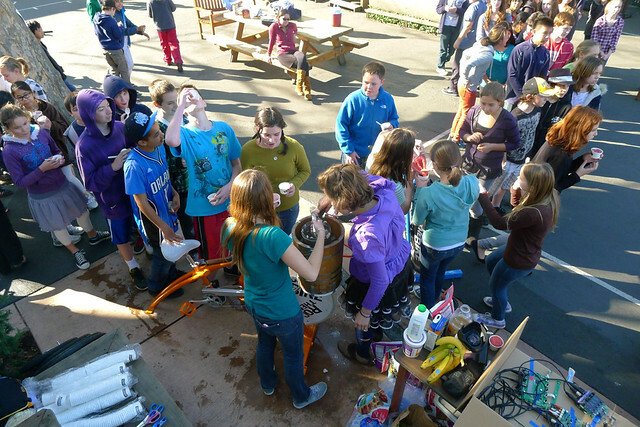 Above: 6th – 8th graders crank out Pedal Powered Sorbet (see below) and Bike Blended Smoothies after a school assembly. We now offer full customization for your Fender Blender Pro. Promote your brand, organization, or school with a wheel wrap and custom frame color. 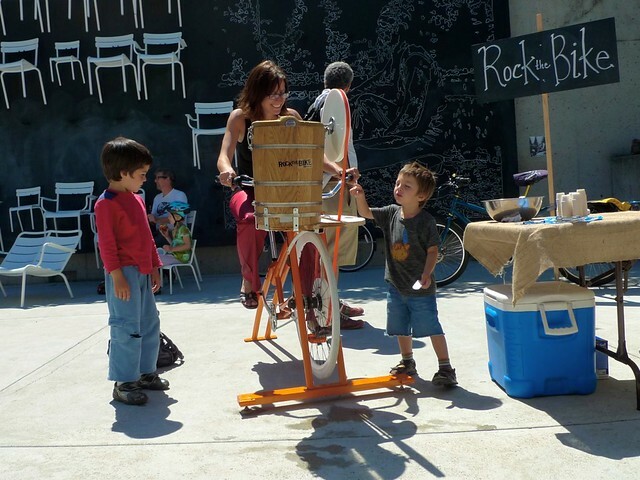 Rock The Bike offers you centerpiece activities for genuinely delightful and engaging large event spaces. Pedal Powered activities such as the sLEDgehammer, Recharge Desk and DJ Music Booth create chances for your event goers to move their bodies while getting off their feet–a welcome change from a day full of walking, standing, and sitting. Rock The Bike activities allow your staff (or our coaches!) to make a human connection with participants. By guiding the participant through a fresh experience, you’ll be able to talk to people one on one about your message. Sample a beverage, talk about a campaign, promote a product. People will be ready to listen. This ensures that your event will be dynamic and professional. Our fully customizable bikes and gear are bright and colorful. They help create polished spaces where you don’t have to compete for people’s attention and messaging is clear. When you combine our activities you provide more ways for participants to jump in, opening up their heart, clearing their mental blocks and reducing their stresses. Humans are naturally curious creatures and pedal power is a way to engage folks of all ages and fitness levels. Our colorful, attractive cruiser-style bikes are well designed with comfort and delight in mind. The saddle–plush, the grips–ergonomic and the pedals–slip resistant, the ride–smooth as butter. Some of our activities are inherently harder than others. The sLEDgehammer is a short hard sprint while the Recharge Station is easy and continuous. Mixing our activities is good for connecting with riders of different fitness levels, old and young. Even folks who don’t know how to ride a bike or are nervous about riding in the street can hop on and join the fun, with an instant payoff. Fear not the flat event! 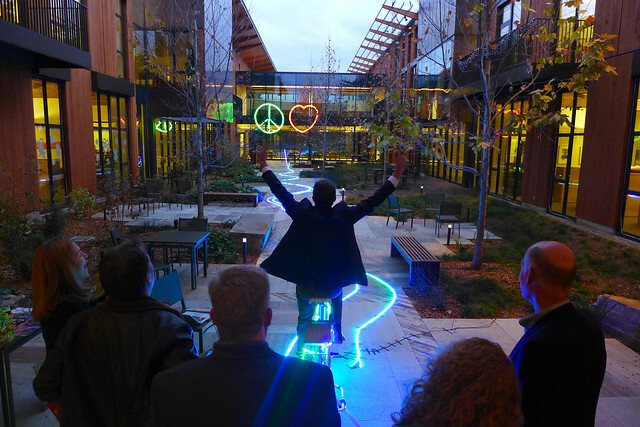 With one or all of our activities, you bring peoples’ eyes up from their digital devices and into a Pedal Powered state of blissful openness, just like we did at this year’s Democratic National Convention. Watch the video above and see DNC Delegates spontaneously begin line dancing. This only happens when people are joyous, open, receptive, feeling it! No one can resist the Cupid Shuffle but we like to think our Pedal Powered energy gave them an extra boost. Having more bikes creates more energy. People like pedaling alongside each other. Pedaling a bike releases endorphins and reduces stress, making people more receptive to your message. Coaching is important. Coaches help people on and off the bikes. They infuse the experience with care, which helps people be receptive and open. Pedal Powered Concerts and related gear. Pedal Power music events, speeches and press conferences, or off-grid parties. Bands love playing on a Pedal Powered Stage because the audience is already moving at the beginning of their set. Organizations, towns, and cities love to speak through a Pedal Powered microphone to send a clear message about going green and the power within the community. Fans get to support the musicians or speakers and help contribute to the show. Our Pedal Powered Stage gear is also great for school assemblies. Middle school students will be tall enough to pedal the assembly, while Elementary school students will enjoy watching. Have an unforgettable assembly at your school while teaching students about physics, how energy is made, and the benefits of bicycling. What does a Pedal Powered event feel like? The easiest way to get started with Pedal Powered Music (or speech) is with a One Bike / One Speaker system from Rock The Bike. One Bike / One Speaker has the simplest setup time of any Pedal Powered Stage system. Check out the video. Here’s an example of what’s possible with a One Bike / One Speaker system: a Pedal Powered press conference on the steps of San Francisco’s City Hall featuring the environmentalist Bill McKibben. Some people prefer a non-food activity because there are no permits required and the materials do not spoil. This activity is compatible with any Fender Blender purchased since 2009. A belt (visible in the prototype above) takes power from the wheel and transmits it to the spinning platter within the drum. Pedal Powered Spin Art connects to a Fender Blender without tools, allowing you to expand your range of possibilities. The drum also comes with its own adjustable-length table legs, allowing you to do Pedal Powered Spin Art anywhere. Leave your attendees with a lasting memory from your event! 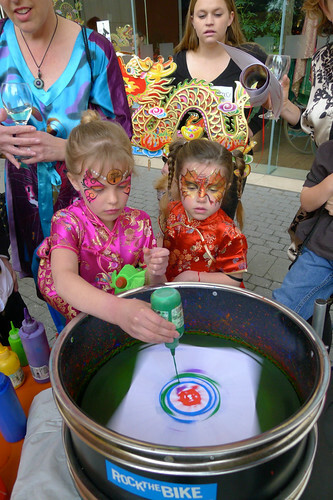 Spin Art is a great activity for kids. Spin Art is the easiest of all our activities to pedal in terms of physical exertion. It’s not a race, you just need to keep the platter spinning. Fast and slow both have their effects on the resulting artwork. The artiste can communicate what they want from the pedaler, including when a piece is finished and it’s time to see it stopped. Kids 10 and up will enjoy powering the experience for others; kids even younger can be the artiste. 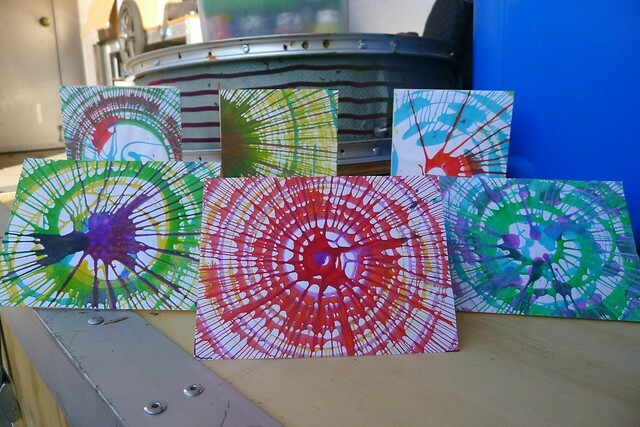 Spin Art is colorful, creative, peaceful, and inspiring. 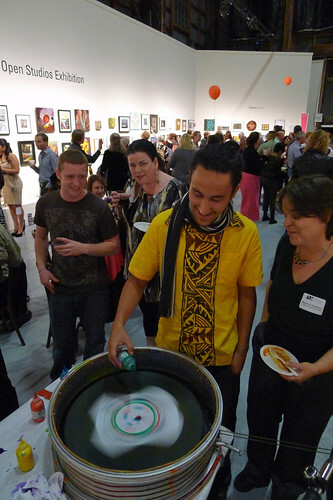 The process of making spin art is visually stimulating and always gets an audience — people often stick around to watch many others take a turn. It’s quick to set up and easy to do; all you need in addition are paint, paper, and a table for drying! Stamp your logo on the blank paper (or letterhead). Use leftover artwork to decorate the event, or save it for projects like greeting cards. Leftover supplies will last from one event to the next, as long as you save them properly. 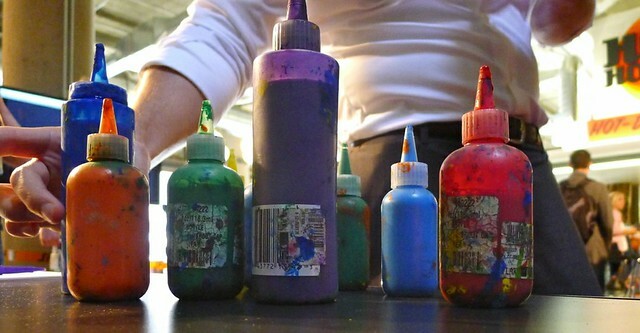 You’ll need tempera paint and squeeze bottles (above), as well as paper and some type of drying system (either lots of table space or string and clothespins). You can use a stamp or sticker to leave a permanent imprint on the paper. It may be pinned to a wall for years afterward, making your logo or message a permanent fixture in someone’s room. Spin Art is not just for kids; adults are equally excited to take part in the Pedal Powered version of this classic activity. Two unrivaled crowd pleasers, ice cream and Pedal Power, combine in this engrossing event activity. Serve up Pedal Powered Ice Cream and watch community match unfold. Pedal Powered Ice Cream is great for events with kids, who will be fascinated with the mechanical workings and delighted with the tasty results. Kids as young as 10 can pedal the bike and handle the level of exertion required. Activate their minds and bodies as you combine local ingredients with their good clean Pedal Power. It takes about 20 minutes to make a batch. People take turns; it’s not a race. The whirring and stirring noises from the machine are pleasant and won’t get in the way of teaching moments along the way, oohs and aahs. At the end you check for doneness by slipping the belt off the pulley, and popping the steel canister open. You can expect soft serve-gelato consistency. By mastering the freezing process, in which you combine ice, salt and cold water to create a sub-zero bath around the canister, you’ll be able to achieve a denser, more spoonable ice cream. 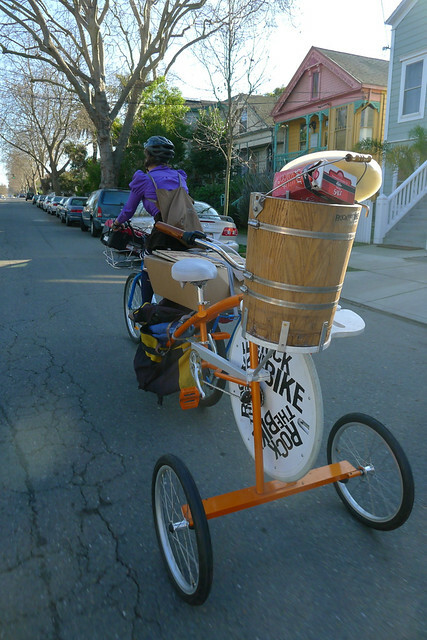 Built on a Fender Blender Pro frame, the Ice Cream Bike can be towed behind any bicycle using our trailer kit. An Ice Cream Bike is a hit at events year-round, indoors or out: fairs, concerts, conventions, gala dinners, trade shows, food cart gatherings, and summer camps. Satisfy the specialty dietary needs of your audience with low-fat alternatives like frozen yogurt or dairy-free recipes such as sorbet. Team up with a local dairy, egg, or berry farm and you might find a low-cost or sponsored source of ingredients along with an opportunity to co-promote their foods. If you’re serious about doling out sweet treats at your event, the Ice Cream bike can pump out up to 6 gallons of ice cream an hour! (Ask about our new 2 gallon size upgrade.) You’ll be nurturing them with calcium, too. The state of the art sLEDgehammer harkens back to the classic carnival sledgehammer game, except here the challenge is to put your peak power output into the pedals of an efficient bicycle generator. Crowds will form to watch the display of human strength, and impromptu competitions erupt in cheers and celebrations. The sLEDgehammer can be set up as an event activity or as a semi-permanent custom install in a large space. The circuitry is robust enough to handle the momentary burst of power that people will summon when motivated by a challenge as cool as this. This activity is visible across a wide space, so people from across a room or plaza will be able to see. Click here to watch it in action. Rock the Bike’s LED Stage Lighting Panels are a simple way to get your audience involved. 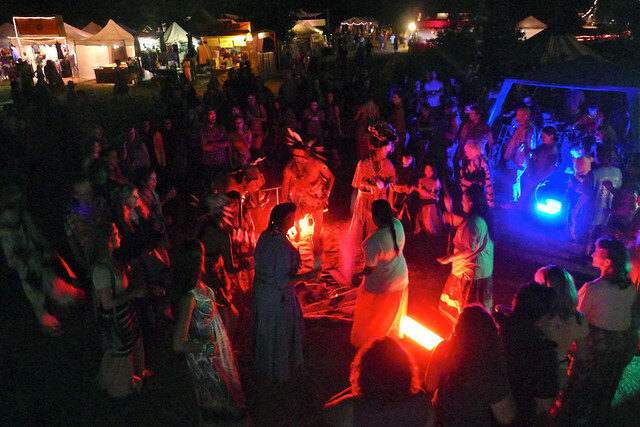 Throw light on the crowd and performers at your event. Give pedalers the chance to set the mood with unique color combinations. Above: Sir Richard Branson pedals an early Rock the Bike light activity at the 2007 Virgin Mobile Festival.